Portalegre – Portugal (October 27th) – Xtreme+ is world champion of T3. 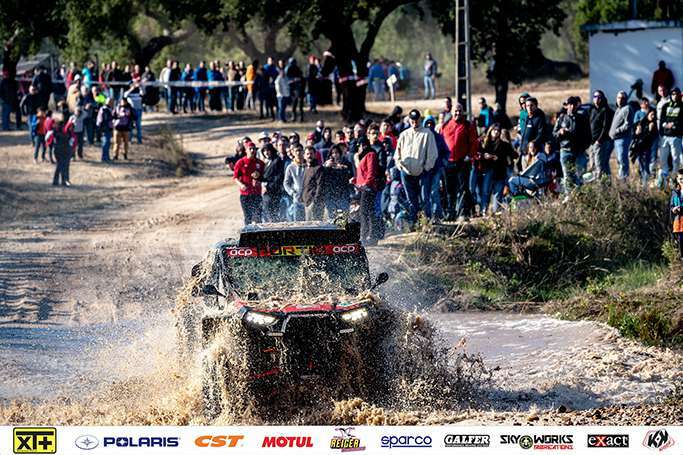 The Spanish crew José Luis Peña Campo and Rafael Tornabell Cordoba, on Polaris RZR 1000, won the podium of the Baja Portalegre 500, the last stage of the FIA 2018 World Cup Cross Country Rally, thus winning the overall title of T3. That on the Portuguese tracks has been an exciting challenge between Polaris and Yamaha with Peña Campo and his rival Santiago Navarro protagonists of an excellent motor season. For the first time since the launch of the World Cup in the T3 category, the fate of the championship was decided in the last special stage of the final leg in Portugal, rewarding the grit and determination of Xtreme+ with an important world title, the fifth after those achieved in 2013, 2014, 2016 and 2017.
the SS4 when the Yamaha rider got caught up against a tree. With a great tension, José Luis has been able to conclude perfectly the special stage without taking any risk, cutting the finish line first and thus conquering the world title of T3. A nice victory made possible by the collaboration of the whole team, from mechanics to drivers of assistance vehicles up to those who work from the headquarters in France: thanks to Sylvain, Renato, Gilles, Freddo, Enzo, Alexis, Jesus, Cédric, Manu, Alain and all other boys. To Ana for taking care of the logistics and organization, indispensable help for Xtreme+. A big thanks to everyone. Here, this is one of those victories that I like more because it is the success of a team that puts heart and soul … “. After a long sports season – 2018 has seen 11 races taking place in 11 countries and 3 different continents – Peña Campo and Tornabell Cordoba are the first Spaniards to become Cross Country World Champions in the T3 category (only compatriot Carlos Sainz had won the title absolute in the past). “I really do not know what to say, I have no words – explains an excited José Luis – It is a triumph dedicated to Rafa because without his help and his professionalism we would never have achieved this goal; to the whole Xtreme+ Team that made Polaris perfect at every race; to Marco Piana who believed in me; to my wife Balby and my family and of course to the sponsors for their precious help “. If the Spanish crew has reported a brilliant result, the other two Polaris RZR 1000 competing at the Baja Portalegre 500 have certainly not been outdone. Vincent Gonzalez, sailed by Loic Minaudier, has crossed the finish line in the Portuguese leg finishing second and winning the third overall podium in the T3 World Cup. This season, the Swiss driver has not only shown he has excellent driver skills but also proved to be “the” perfect team-mate helping Peña Campo in his race to conquer the world title. Without forgetting that it was Gonzalez who helped Navarro when he and his Yamaha had a problem in the SS4. 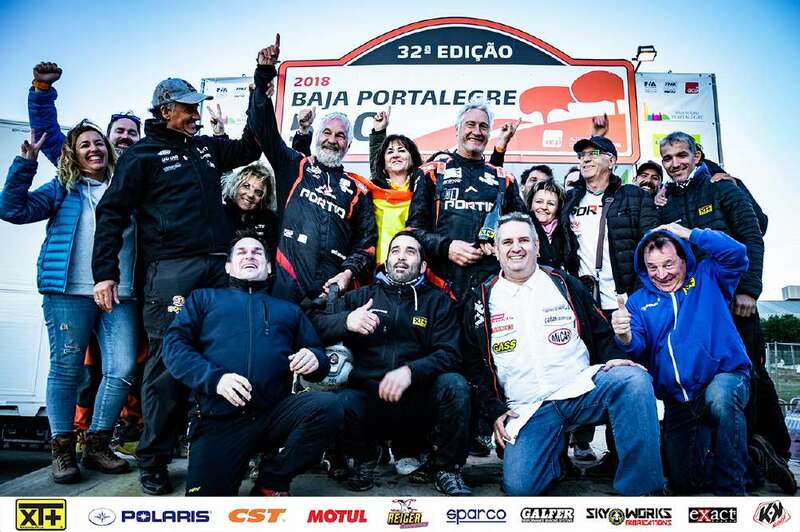 This 32nd edition of the Baja Portalegre 500 finally saw another crew of Xtreme+ win the podium: the British Graham Knight and David Watson were indeed classified third behind team-mates Peña Campo and Gonzalez. At the wheel of their Razor 1000 in some legs of 2018 to gain more confidence with the vehicle, Graham and David were just as essential to the victory of the Spanish rider and the whole team for the joy and good humor always brought with them. Upcoming races? “After this great victory we are now preparing for the Dakar in Peru where Xtreme+ will be present with some crews – says Marco Piana, in the race at the Baja Portalegre 500 with Sébastien Delaunay – We will do our best: on the other hand, after an unforgettable year like this it can be done differently!”. Xtreme+ thanks for the valuable support: Polaris Europe and France with Manu Péan and Rodrigo Lourenco for the supply of original spare parts; CST for extremely performing and robust tires that have allowed excellent results on all types of terrain; Motul for lubricating products; Galfer with disks and pads for safe braking; Reiger Suspensions, with Henk Helleger, for the essential assistance in the set-up; Kutvek Kitgraphik for the realization of the Polaris graphics; Rouge Fusion for the supply of customized competition exhausts; Lortec for engine tuning; Alves Turin (Italy), with Gabriele, Ezio and Sandro, for the construction of the frames and the development of the Polaris 1000; Maxiracing Component of Turin (Italy) with Elvio for the accessories in fiber, carbon and kevlar.